Isiah Factor | The Insite » WIG DUO WANTED FOR BANK ROBBERY! WIG DUO WANTED FOR BANK ROBBERY! 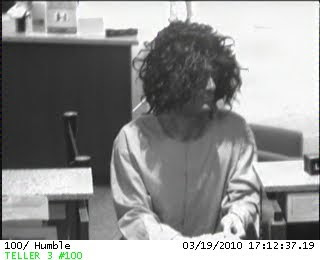 March 19, 2010 | Posted in Uncategorized | Comments Off on WIG DUO WANTED FOR BANK ROBBERY! The Houston FBI Bank Robbery Task Force is seeking the public’s assistance in identifying two men who wore wigs in an attempt to disguise their identity during a bank robbery earlier this evening. The bank’s surveillance cameras captured several photographs of the duo as they robbed the Amegy bank, located at 9441 FM 1960 in Humble Texas. At approximately 5:17p.m., the men entered the bank, and together walked up to the teller counter. One repeatedly demanded “Give me all your money!” The teller complied and the men exited the bank with their bags full of cash. At least one witness observed the men getting into an unknown vehicle parked a distanced from the bank. Additional witnesses are being sought for interviews. No weapons were observed by witnesses during the robbery. No one was physically hurt during the robbery. The robbers were both described as two males, unknown race, 5’8”– 6’ tall, 160-170 pounds with a thin build. 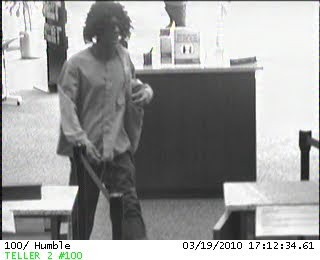 Both men wore dark brown colored make-up on their faces and wore black, curly, shoulder-length wigs during the robbery. Crime Stoppers is offering up to $5,000.00 for information leading to the charging and arrest of this robber, or any felony suspect. If you have information about this robbery, or these robbers, please call the Crime Stoppers tip line at 713-222-TIPS (8477).